The Gamma Synthetic Gut 1.30mm tennis string set is 12.2m (40ft) long to enable you to re-string one racket with it. The Synthetic Gut is an all-round performance tennis string that can meet the needs of all level players with various playing styles. It features an excellent playability and an enhanced durability, which ensures long lasting usage and excellent performance for a variety of users. The gauge of the string is 16 (1.30mm). for submitting product information about Gamma Synthetic Gut 1.30mm Tennis String Set We aim to answer all questions within 2-3 days. 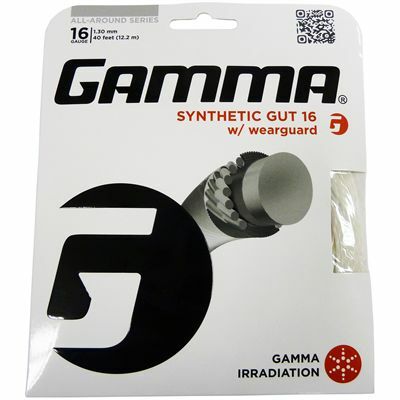 for submitting product information about Gamma Synthetic Gut 1.30mm Tennis String Set. We aim to answer all questions within 2-3 days. If you provided your name and email address, we will email you as soon as the answer is published. for submitting product review about Gamma Synthetic Gut 1.30mm Tennis String Set.